Editor's Choice - top selling dog books & collector’s classics. Curl up with a great dog book and a devoted dog at your feet and enrich your soul. Studious dog health, breeding, training, or nutrition books for the serious breeder or delightful fiction for sharing with your children. by Fred Lanting, All-breed and SV judge, Sieger and Schutzhund specialist. Only someone with a background such as Mr. Lanting (all-breed judge for UKC and many foreign organizations, and a former multi-breed AKC judge) could have written this book. 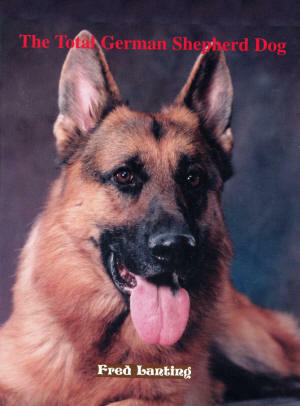 Internationally known as Mr. GSD, Lanting’s book is nearly as valuable as is a Sieger Show trip or years of breed study under lesser tutors. We highly recommend this lavishly illustrated “total” work on the breed. 17 of the 20 chapters are suitable for owners of any breed. This book belongs on every fancier’s bookshelf.